The Sarge shows himself to be quite a decent guy here. I think some readers will find the conclusion a bit heavy but it can be a bit too easy to get carried away when every headline suggests progress. Hopefully Stig will advance much further. Nothing in the paper versions of newspapers here in Belgium but still comments on the websites of Het Nieuwsblad and Het Laatste Nieuws yesterday. Actually Sergeant had an interview with Humo. He visited Stig three weeks ago. He couldn't talk yet but could converse and understood everything. Marc started to talk about the season to come and asked Stig who in the team was a contender for classic win. For Tim Wellens and Jürgen Roelandts he nodded. When Marc's wife suggested Frederik Frison, he had to laugh and convincingly shook his head. Sergeant will never forget Loïc Chetout's attitude after the crash. I don't know if it had been highlighted at that time. Loïc kept Stig's head on his knees for almost an hour just because he was willing to. He thereby saved Stig's life giving him first care. It's now 20 days ago but I still post it here. Kris Boeckmans also saw a "very good evolution. An evolution that is still in progress and let's hope that it will keep on." He tries to regularly visit him. Boeckie was interviewed about his own recovery after the terrible crash at the Tour of Spain in 2015. Back then it was a great year for him. He had made a step forward towards leadership in the team. 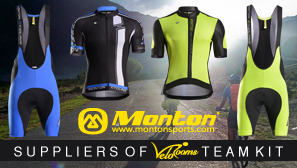 He had had a great win against Gianni Meersman in the Samyn Memorial. So sad to see that now Gianni also has had health issue and had to retire. During his recovery and his two weeks in artificial coma, Boeckie got a letter from Stig that he has always kept and that now has great emotional value. The roles are reversed now. Stig sent it to Kris "Machien" Boeckmans. "Machine", that was Stig's own joke. ...He has also progressed to the point where he can exercise on a stationary bike, and "even dares to cheat and reset the 30 minute timer at the end of the session so he can ride longer". Fan Club says that Stig learned to independently breathe, eat, drink and talk. He's motivated to revalidate very hard and is everyday looking forward to sweating on his stationary bike (hence the resetting mentioned by Killswitch). His father also talks about the "realisation" process that is rising in Stig's mind. "He asks questions about his future. Sometimes it's hard but it does not demoralise him, on the contrary." I remember that in the Laatste Nieuws article I shared with you back in October that that was the period Stig's mother was most afraid of, the moment Stig is aware of what has happened to him. It should have been scary but it's going good too. This is an amazing story. And brilliant news. 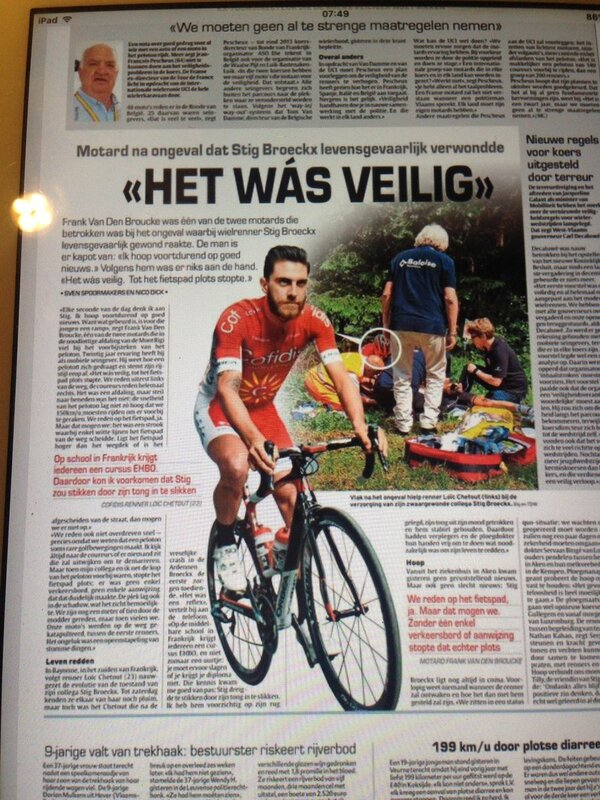 Sporza spoke to Loïc Chetout during the Tour of Belgium, who stayed with Stig Broeckx after the accident a year ago. "We did not wear the same shirt, we did not belong in the same team, but at times like that the race does not matter." Today 28th of May is exactly one year since the terrible crash. It's often been said to me how the idea came to you to do all that. Well it's just that in France there are mandatory "First Aid" training at school and it was just a reflex. In such moment you do not think about the race. We are human beings after all although we do not wear the same jersey. I clearly did not think he would come back so well. It's a miracle that he came back so well and it is just a joy to see he is getting better and better but you still keep big after-effects of course and I do feel that when on the bike. I take a lot less risks. It's harder for me to get into sprints and so on because as long as you haven't been confronted to that kind of things you don't know and now I know what can happen with a crash at 60kmh. So I'm saying to myself, well the bike is great but there's still a life next to it as well. No more news in the media but I just visited Stig's official website. One year ago the Stig Broeckx fanclub and Lotto-Soudal introduced the Fight for Stig action. Teammates and friends wore bracelets with the strong words: "Fight for Stig" written on it. I remember that Greg Van Avermaet wore it on the podium at the Rio Olympics. Local shops in and around Dessel (Stig's hometown close to Antwerp) and bike shops throughout Flanders helped selling the bracelets. And online the bracelets could be sold, worldwide !!! Of course there's no commercial goal behind it and the money raised would fully go to Stig's recovery. I thought that gave an idea of the good progress that he's further made since last news report, which already were very positive. A much more recent article here informs us that the Fanclub is about to close the official Fight for Stig action on Sunday 19 November, organising a big winter barbecue as ceremony to thank everybody (friends and supporters will still give aid though but the official campaign will stop). Well apparently, they are used to organising barbecue's even when Stig was fit but still it's a nice touch, though I don't like barbecue's personally. Some people from Lotto-SOudal will be present apparently. More importantly, the article informs us that Stig is still busy with his recovery. His fighting spirit and fortitude from the race is still present. He does it good! Whether Stig Broeckx ever will come back in the peloton is a question "we cannot answer yet" says team doctor Servaas Bingé on Radio 1 but last week Stig was present at the Lotto "Team Days". I then had a nice chat with Stig. He hasn't tried the new kit but has eaten along with his teammates. It was a very pleasant evening. I asked him if he was happy and he said "Yes, I'm happy". I think that we have seen one. [... words I cannot understand] that consciousness has come back step by step while this was not judged possible from a medical viewpoint. If this is something you may call a miracle, then this is one. We had never expected he would have gone that far, that he would awake because it lasted long but the steps that he made we could never expect. I think becoming a rider is absolutely not on the agenda. The chance that he becomes a rider, if we are realistic, that can no longer be, I think. For as long as I can or may make a statement about it but it's not on the agenda either. There's an all different goal for Stig, which he may reach, which we all hope he may get to. He's still a beautiful person? Initially he found it frightining. He had a lot of trouble to undergo this. He is very grateful for everything that they did to him. He says maybe 1,000 times, 'thanks', while this is absolutely not needed but it's his personality, his nature. That Stig may remain on this world and improve to an acceptable level. I think that he can be someone who can good inspire others with his attitude and motivation. Then I'm convinced that they will not remember him as the boy from the crash. I need help from Native speakers of Dutch because I'm afraid it's sometimes hard to get what they are saying. Please, do correct me if I've made any translation mistake because I very likely made some. By the way, though I haven't had time to read the following article, I do wish to share this link on these boards as well. He says that the bike ride did a lot of good and that he still has love for racing. The interviewer of the show give an award "De Ster van Studio Brussel" to deserving and courageous people in Brabant and they gave it to Stig. He rode for 40km. Next objective is riding on a race bike and no longer on a mountainbike. For what it's worth, when my grandma had suffered a stroke, her speech was still slurred for quite a while - months at least - afterwards. And that was 'only' a stroke, not months in a coma. It was worse with my grandpa. After he had his first thrombosis, he had a slurred speech for the rest of his life, 10 years... He consulted a logopedist for a few months, but she realised that there was nothing to do to improve his speech. When I heard Stig speaking for the first time after his crash (last year's show), I directly remembered my grandfather. But Stig is young and I guess he also must have the strength to improve that as well. And also that's why I find it a good news that a logopedist is still working with him as well. Stig was last Wednesday (12 December 2018) at the Liège University for the 3rd European Coma Day. 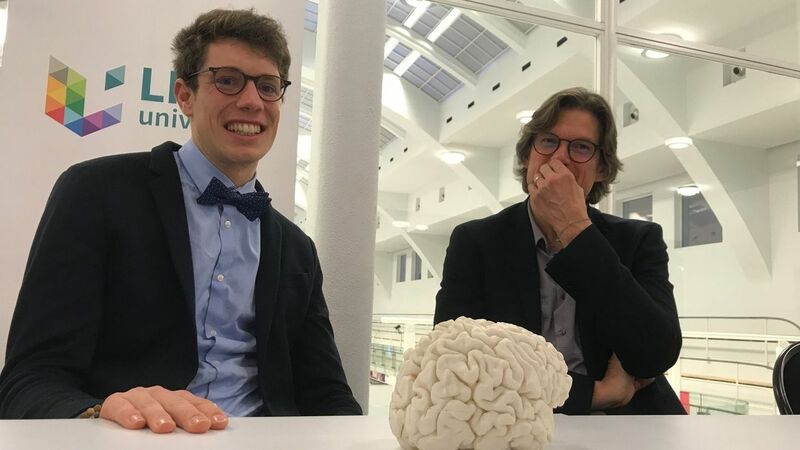 He's here on the picture with neurologist Steven Laureys, a professor at the University and a specialist in coma, and a 3D reproduction of his brains after the accident. Pr. Laureys claims that 25 to 30 years ago, Stig wouldn't have been able to mount a bike back after such crash and it's even possible that would have passed away, that we have leading researchers in Belgium who are developping new means and a new medecine is being tested. We may be proud of that, he says. Stig says that it's always a bit better with him and that it's great that he's now independent, that The mind enabled him to pass those tests. "I've always believed in it." The article claimed that he remained 7 months in coma. Inaccurate! That was about 3 months.